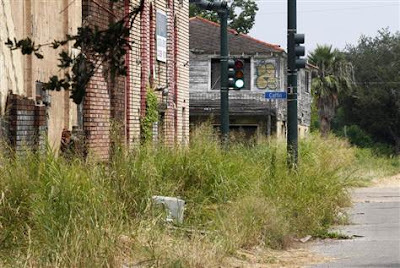 NEW ORLEANS (AP) — In New Orleans' Lower 9th Ward, the grasses grow taller than people and street after street is scarred by empty decaying houses, the lives that once played out inside their walls hardly imaginable now. St. Claude Avenue, the once moderately busy commercial thoroughfare, looks like the main street of a railroad town bypassed long ago by the interstate. Most buildings are shuttered, "For Sale" signs stuck on their sides. There aren't many buyers. And the businesses that are open are mostly corner stores where folks buy pricey cigarettes, liquor and packaged food. Six years after Hurricane Katrina slammed into the Gulf Coast, the New Orleans neighborhood that was hardest hit still looks like a ghost town. Redevelopment has been slow in coming, and the neighborhood has just 5,500 residents — one-third its pre-Katrina population. But politicians, investors and celebrities continue to promise a better future. City leaders recently announced plans to rebuild a high school and pave the neighborhood's roads. And actor Wendell Pierce, who stars in an HBO series about New Orleans, is backing a new supermarket for an area that hasn't had one in 20 years. While residents welcome the news, they remain skeptical. Promises have been dashed too many times. Look around you at the Katrina houses!" said Robert Stark, a 54-year-old disabled veteran, sweating in stifling August heat on a porch looking onto Flood Street. He waved at two vacant crumbling houses, like so many that dot the Lower 9th Ward. He shook his head and added: "Look at the grass." In many lots, fields of high grass grow in place of houses. "There ain't nothing new down here. Nothing new ... nothing new." Since Katrina, the predominantly black neighborhood has been the site of rebuilding by environmental groups and thousands of volunteers. There's now an eco-friendly community center and a cluster of more than 50 modernistic houses, built with the help of actor Brad Pitt. It sits near where the floodwall toppled on Aug. 29, 2005, killing dozens of people and swamping thousands of homes with floodwaters that reached rooftops. Also, a charter school has been rebuilt and many of the shotgun-style homes and Creole cottages in the older part of the neighborhood, Holy Cross, are a display of bright New Orleans colors and cheery yards. But residents of the Lower 9th Ward, downriver from the French Quarter, nevertheless feel left behind. Other parts of New Orleans have flourished thanks to federal recovery dollars that have brought new businesses, schools and streets. Entrepreneurship and civic engagement is up, city schools have shown test-score gains and the middle class is growing, according to a new report by the Greater New Orleans Community Data Center, a group tracking the city's recovery. Even crime — still nearly twice the national average — is being held in check and falling, the report said. Meanwhile, the Army Corps of Engineers is getting closer to finishing $14 billion in work to better shield the city from future hurricanes. "Some of the data shows that New Orleans is rebuilding better than before," said Allison Plyer, deputy director of the Greater New Orleans Community Data Center. Still, Plyer said the Lower 9th Ward is among a number of low-income communities that have had difficulty rebuilding since Katrina's flooding. In the Lower 9th Ward, the fire station for Engine 39 hasn't been rebuilt. Instead, the firefighters use a trailer. Schools and churches are boarded up. Scores of houses still bear the markings of search-and-rescue crews — the now familiar "X" spray painted on doors and the front of houses to designate whether a building had been searched, by whom and whether any bodies had been found inside. The only difference is they are faded now. The lack of people makes those who've come back feel that their neighborhood has been forgotten, even though a steady stream of politicians came to promise to help after Katrina and millions of dollars flowed in. Now there's a new push to revive the neighborhood. In recent days, city leaders have put forward plans to rebuild the Alfred Lawless High School and spend $45 million repaving most of the streets where the heaviest damage took place. A group of investors that includes Pierce, a New Orleans native starring on the HBO show "Treme," has announced plans to build a full-scale grocery store on the grounds of a former baseball field by 2013. Developers hope to get federal hurricane recovery low-interest and forgivable loans. If built, the 25,000-square-foot store would represent one of the first pioneering commercial investments for the Lower 9th Ward since Katrina. Pierce said big-chain supermarkets are unable to see the potential for profit in a place like the Lower 9th Ward, where his parents lived before he was born. "Corporate America only sees the risk side of the ledger," he said. "I'm tired of industry standing on the sidelines. There is value here, there is wealth here... It's pent-up demand and I feel as though it is something that can be mined." David J. Livingston, a Wisconsin-based grocery consultant who's studied the New Orleans market, said the Lower 9th Ward is too depopulated to support a supermarket. He questioned whether the Lower 9th Ward, cut off by an industrial canal from the rest of New Orleans, can ever be a lively spot for commerce despite the best efforts of actors Pitt and Pierce. "All the work that Brad Pitt has done, has it really made a significant difference? Glad he did it, better than it was. But it's still not the garden spot of New Orleans," Livingston said, referring to the cluster of eco-friendly homes built by the Pitt-backed foundation Make It Right. But local residents and merchants hold out hope the supermarket can help turn things around. "Maybe some of the folks going to the supermarket would come here," said April Lawrence, the owner of a beauty salon who took a chance and opened in 2009 on Dauphine Street. "Today, I have just one client," she said glumly. Unless business picks up, she said, she will have to close. Down the street, regulars sat outside on the sidewalk in front of Mercedes' Place, a bar and video poker spot, chatting, drinking and smoking. For them, anything would be better than the options they have now: Drive miles to get something decent to cook up at home. "It's needed!" Lynette Gibson said emphatically and loudly. She helps her 72-year-old mother, Mercedes, run the bar. She shook her head at the thought of the handful of gas stations and convenience stores on the main streets. "It's limited," she said. "They only satisfy neighborhood people who drink." Roosevelt Johnson Sr., a 51-year-old disabled veteran, stood outside his house and looked at the empty grass field where the grocery store would be built. "With them bringing a supermarket, it might increase property values," he reasoned. "It might bring some normalcy back here. Make it like any other neighborhood where you go 10 minutes to the supermarket."